The newest technology that has drivers coming to our Bergen County NJ dealership location talking is INFINITI ProPILOT Assist. That’s because this feature is the first step towards a fully self-driving car. Autonomous, or self-driving, vehicles were once only seen in movies or on TV. INFINITI is making it a reality thanks to ProPILOT Assist. At the time of this post, the only model equipped with this amenity is the INFINITI QX50… but we’re sure that there will be more INFINITI luxury cars and SUVs that’ll soon have it. What ProPILOT Assist does is assist you by automatically steering, braking and accelerating your vehicle while driving on the highway when driving in a single lane with the press of a couple of buttons, even around curves. How does ProPILOT Assist work? Let’s take a look. The core of ProPILOT Assist are 2 features: steering assist and advanced intelligent cruise control. Steering assist eliminates the need for you to make small steering corrections within your lane by detecting the lane markers on either side of your vehicle to ensure it’s in the center of the lane. Advanced intelligent cruise control adapts to a full speed range in traffic and will even come to a complete stop if necessary & accelerate when traffic picks back up. There are 3 distance settings to choose from and a sensor monitors how close you are to the car ahead of you to ensure you’re not too close or too far for your comfort. What is the Future of INFINITI ProPILOT Assist? As we said earlier, the ultimate goal would be a self-driving luxury car or SUV. So we foresee a gradual increase in the capabilities ProPILOT Assist has to offer. The first step would be a move from single-lane highway driving to multi-lane highway driving. The next step would be the addition of navigating through city streets or on roads around your hometown. We also predict that the QX80, QX60, QX30, Q70, Q60 and Q50 will also add INFINITI ProPILOT Assist to their technology suite. It’s typical that one model gets a certain innovative feature and the others soon follow and we don’t see ProPILOT Assist being any different. 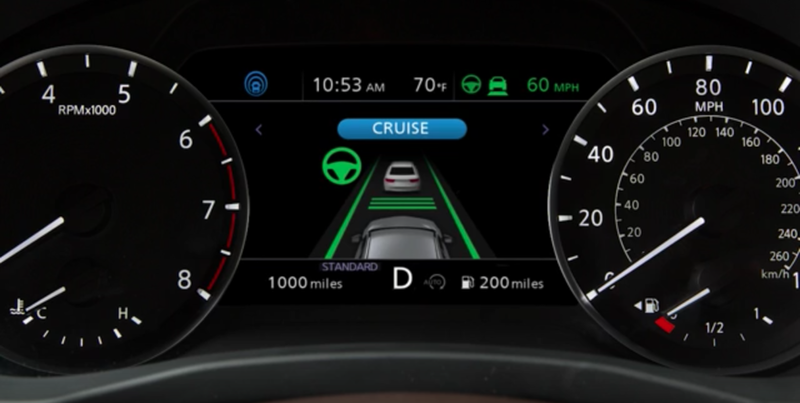 Ramsey INFINITI has all of the info you need about ProPILOT Assist, so contact our team today to learn more about this innovative new feature!